New Book Empowers Readers to Better Communicate with Anyone – in Any Situation! 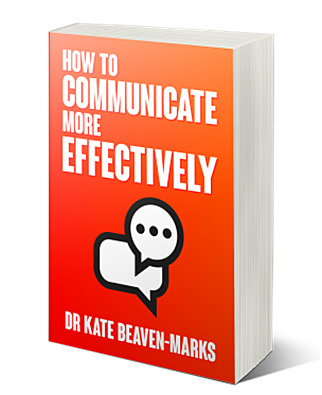 Having spent the past twenty years as a psychology of communication and language expert working in industries including sport, education, high-risk industry, healthcare, hypnotherapy and local government, Dr Kate Beaven-Marks knows that most people crave the skills to communicate more effectively. However, it’s a desire that’s so often swept under the rug, which, if acted upon, could highly benefit those individuals that want to improve all aspects of their communication skills and their lives. In her new book, Dr Kate answers this calling with gusto. ‘How to Communicate More Effectively’ has a simple yet powerful mandate – to help any reader better communicate with anyone, in any situation. Communication expert, Dr Kate Beaven-Marks offers insight into how we communicate, both with others and with ourselves. This book shows you how to engage with a range of ‘real-world’ spoken and non-verbal strategies and personal skills, to elevate the effectiveness of your communication beyond just simple words. By gaining a better understanding of how to communicate more effectively, you will quickly learn how language can positively influence all aspects of your life. Whether you want to enjoy better relationships with friends or family, or learn to positively influence others in your workplace, this book will give you the tools to transform both your communication skills and the way you think about yourself as a communicator.